This new thread to anounce the Project Airbus A320 FD-FMC version released after 3 years of developement. FD-FMC is a simplified FMC, with an unrealistic appearence, but a real flight management. Indeed, it offers real vertical navigation features. Only for FSX+SP2 or P3D. Many thanks to Project Airbus team that authorized me to use their fabulous Aircraft, and many thanks to all Project Aitbus forum members who help me to debug this panel. Please,read the user manual provided with the Aircraft. Last edited by fdd_fr on 21 Oct 2015, 16:34, edited 3 times in total. Thanks very much for this, Francois. Great job. FD-FMC philosophy is that substance is more important than form. However, it manages aircraft flight dynamics like a real Airliner (other freeware FMC like VAS-FMC do it ). It manages Vertical navigation . it works with the FSX GPS macro functions (thanks to Bob Mc Elrath, who documented all FSX GPS hidden XML functions). SID, STAR and approaches are created by "FreenavDBgroup" members. Procedure are included in data files for each airports (130 airports realized today). A free "AIRAC" file, updated weekly, add FSX missing navaidsi. When an airport is in the Freenav database, you can add at your flight plan SID, STAR and aproach. You can save tyour flight, FD-FMC overwrite and update the FSX ".PLN" file. You can also add or delete flight plan waypoints with the Gauge, and create your own SID/STAR when airport is not in the database. - Freenav procedure includes altitude/speed constraint, holding patterns, ARC-DME. This is the hidden part of the iceberg. From take-off until landing, FD-FMC manages aircraft behavior. You can select take-off thrust, climb thrust, speeds and the gauge manages climb and descent acording your setting, with a constant thrust, and a variable pitch, to hold speed, as real arircraft ! This part is 90% of the programming code (2 years of work only for this part !). Gauge has ist own Autopilot and A/THR code. Climb use THR CLB mode (N1 thrust); FMC controls aircraft pitch to hold speed with constant thrust ! - A/THR during descent is in THR IDLE mode, managed descent(DES) or selected (OP DES), with FMC pitch control. White frame are displayed when you switch a mode. - min speed symbols according flaps configuration and aircraft gross weight. Some new and updated airports have been added to the database, for FD-FMC. Please, note that KRDD has a runway 16 approach in « Back course » mode. Back course approach are not managed by FD-FMC 1.00 but it next gauge update (version 1.10) will manage these approaches. FD-FMC v1.10 will be coming soon ! PAKT 4.02 – Ketchikan – USA Alaska, updated by Wulf Bindewald who added a STAR and an approach for runway 11. Think to download the new AIRAC file (version 10172015). A FMC update coming soon. This update fix some minor bug and add the LOC back course Approach mode (used in some airports, like KRDD). Check this thread to know when update will be available. Some new features was already on the A318 beta, but there are some new features. 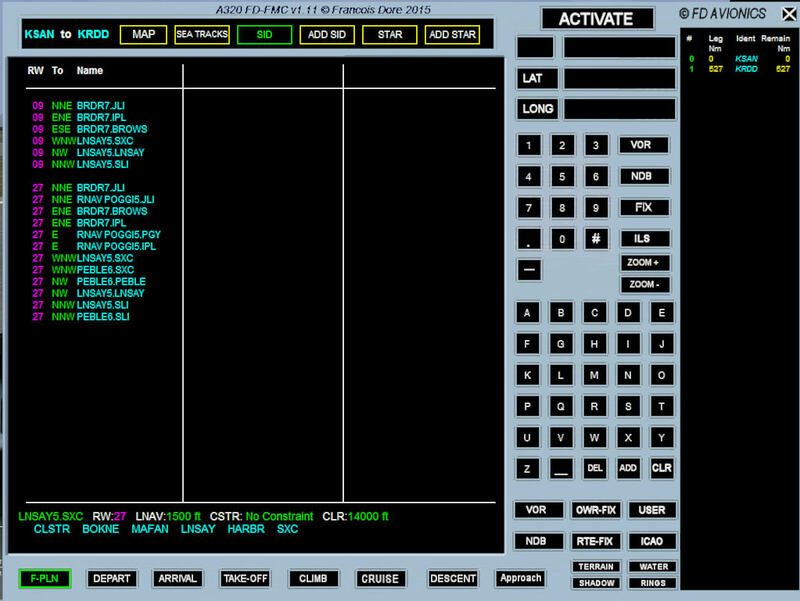 - New LOC Backcourse approach mode, when available on airport :Backcourse mode allows to use ILS signal of the opposite runway to get a Localizer guidance to land. (e.g KRDD Redding, Rwy 16 approach). - When you renounced to take-off, all callout and some take data was lost. Now, after a « reject take-off », all system are reset. - Airport information page (Departure and arrival) display now runways from 3000 feet and more. Previous version displayed runways 4000 feet and longer. - Cruise mode had a bug : When you selected a flight level lower than actual, above the crossover altitude (mach mode) IAS value was not updated during the descent to the new flight level : bug fixed.